Contact lenses can be a safe and effective way to treat vision problems when they are worn as prescribed by your eye doctor. However, many complications can occur when contact lenses are abused by over-wear and/or extending the life of the contact lenses. Each brand of contact lenses has a different replacement schedule. Whether they are daily disposable, 2 week disposable, monthly disposable, extended wear disposable or quarterly disposable, all contact lens wearers should adhere to the replacement schedule. Extending the life of your contact lens can lead to serious ocular complications that range from as mild as an eye infection to very serious complications such as blindness. • Allergic reaction – protein build up occurs when a lens is worn beyond the recommended duration. Excessive protein deposits can cause dry eyes, allergic reactions, discomfort of the eye and conjunctivitis. • Conjunctivitis – over-wearing contact lenses can cause protein build up which in turn can cause a bacterial infection, also known as Pink Eye. Symptoms range from redness, burning, itching, tearing, light sensitivity, blurred vision and mucous discharge. • Corneal Edema – also known as swelling of the cornea; fluid accumulation can cause blurred vision, halos around lights due to lack of oxygen. • Lack of oxygen – the longer the contact lens is worn beyond the recommended duration, the less oxygen flow there is to the cornea. It is like starving the cornea of it's food source. • Neovascularization – abnormal blood vessel growth. The cornea is avascular (without blood vessels). But when it is deprived of oxygen, the body responds by growing new and weak blood vessels, hoping to "feed" the cornea with oxygen. This abnormal blood vessel growth can interfere with vision. The new vessels are also weak and can hemorrhage and cause blindness. • Corneal abrasion / Corneal ulcer – due to the lack of oxygen, the surface cells on the corneal become weak and loosen their attachment to the cornea. Corneal abrasions or even worse, corneal ulcers can form causing very serious infection and complications that can lead to blindness. All the above complications are avoidable if lenses are worn with caution and within the recommended replacement schedule. 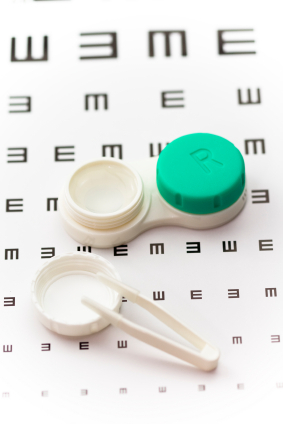 Many times, the contact lens wearer is not even aware that complications are occurring because corneal sensitivity is reduced due to oxygen deprivation. It is important to see your eye care professional every year to check the health of the cornea and over all eye health. Great article. I've been a contact wearer for years now. This article gave me some good tips. Do not wear your contacts past expiration. It's bad for your eyes and can cause complications. The best thing to do is re-order another pair of lenses. I never had a problem with my contacts, but this last round I believe I wore them way past expiration and I believe I did damage my vision. One eye was experiencing some burry vision and light sensitivity, but then it resolved the light issue now only the blurry vision. The strenth went up in one eye and my Dr. Put me on astigmatism contacts for that one eye. Can this be reversed? Would this now take me out the running for eye correction surgery? Great write up! Improper use of Contact lenses do cause a lot of eye damage. Apart from the contact lenses, one should not forget about regular cleansing of the contact lens cases to prevent infections.